How great would it be if we could simply erase all our emotional baggage the same way we use the "DELETE" button on our keyboard when we make errors? This would have been possible if we had the option of not retaining any negative memories or emotions. But unfortunately, our feelings sway over memory and we often hold onto those feelings and emotions, be it from the past or present. 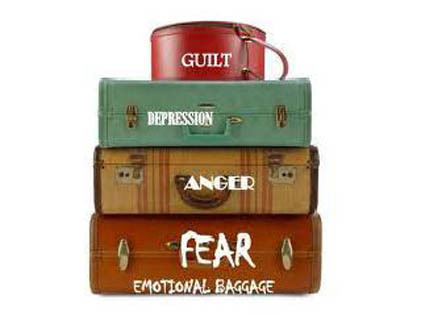 "Emotional baggage refers to all the negative feelings we carry around such as phobias, fears, hatred, and unresolved issues from the past or even doubts about our present lives". These emotions have a way of stagnating and can eventually obscure our thinking and overall wellbeing. Dr. Les Parrott and Dr. Neil Clark Warren provide an undeniable definition of emotional baggage: "History is what has happened in our lives. Baggage is how we feel about it. Your psychological perspective on your past determines, to a great extent, your personal health and vitality." Sometimes old baggage become so comfortable that some people die, never being able to let go of the resentment, pain, and hatred that they may have carried throughout their lives. One has to recognize it and acknowledge his or her accountability to them. "Time heals all wounds" a famous adage that many of us would have heard of at some point in our lives. This is true only if we make an effort and take necessary steps to start the healing process. 1.Acknowledge the feeling or emotion. This is the very first step for you to get rid of the negative emotions. 2.Find the right support. You can reach out to your family and friends but if you are unable to discuss all your feelings and negative emotions openly, it may be time for you to seek unbiased help from a qualified professional. 3.Identify the feeling. Explore how it got there, it may be painful to remember the incident but this will help you find the triggers of what you may have been feeling. 4.Change your thoughts and focus on how you would like to feel instead. Train yourself on how to stop the negative thought patterns, and with practice you will eventually be able to take conscious action to let go of the negative emotions. 5.Distance. Try and avoid or maintain a distance with people who "press your triggers". 6.Forgiveness. No matter how deeply you've been hurt or the kind of impact that it may have had on you, if you fail to forgive, you will continue to dwell on that feeling and eventually be the person stuck with revenge and bitterness. We may not have the option to pack up our emotions in a box and ship them off faraway to a place where we don't have to take charge of them and worry about how they will affect us for the rest of our lives. But, we can make a choice, a choice to let go and embrace the new beginning!